Greetings !!! 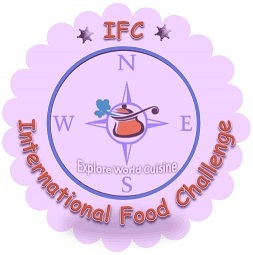 We hope, you guys might have liked our first challenge of International Food Challenge, IFC which is hosted by Saraswathi Tharagaram, we really appreciate each and every one who were all eagerly participated in this first ever challenge of ours. We hope to expect the same kind of enthusiasm and spirit for the rest of the upcoming challenges. So as we speak, we are already in our next month’s challenge, that is September 2013 and it is hosted by me (Shobana). This time we are stepping into French cuisine, one of the most challenging vast cuisines in the world. And we all know that they are famous for their insanely delicious pastries but this time we dig into one of the multi-cuisine region which inherits partly German, partly French culture and so their recipes are influenced from both the countries, which is Alsace-Lorraine region. Alsace and Lorraine are separate regions in France's north-eastern corner, and share borders with Belgium, Luxembourg, Germany and Switzerland. Thrown together geographically but differing in atmosphere, tradition and even language, their names have been inextricably linked by a dramatic and often tragic past. Most of Alsace, a largely Germanic-speaking region, Alsace is frequently mentioned with and as part of Lorraine and the former duchy of Lorraine, since it was a vital part of the duchy, and later because German possession as the imperial province Alsace-Lorraine, 1871–1918) was contested in the 19th and 20th centuries. Although German dialects were spoken in Alsace for most of its history, the dominant language in Alsace today is French. The historical language of Alsace is Alsatian,a Germanic type (Franconian) dialect spoken in Lorraine and across the Rhine, but today all Alsatians speak French, the official language of France. Alsatian cuisine, somehow based on Germanic culinary traditions, is marked by the use of pork in various forms. Traditional dishes include baeckeoffe, flammekueche, choucroute, quiche lorraine and fleischnacka. Southern Alsace, also called the Sundgau, is characterized by carpe frite (that also exists in Yidish tradition). 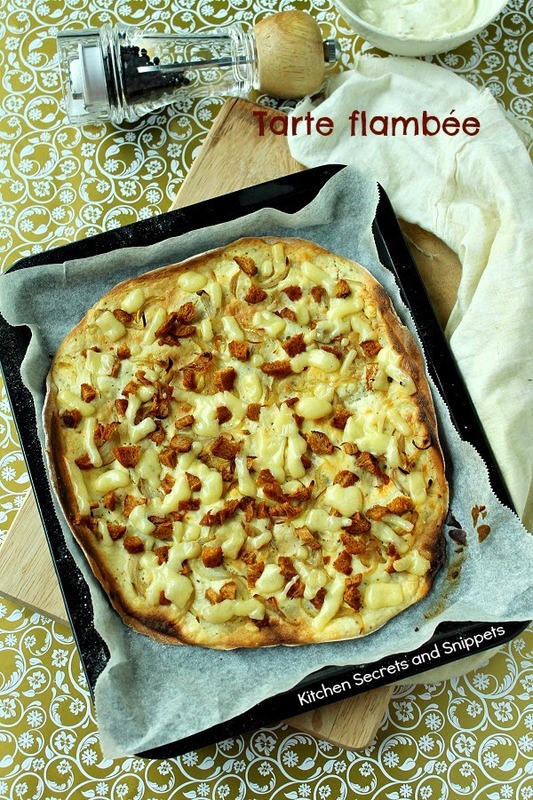 Actually I’ve referred many recipes so can’t give credit to only one, but I can say I’ve referenced seriouseats to get an idea of making Tarte Flambé. Traditionally, it is made with wheat flour, Olive oil, salt, topped with cheese sauce, sliced onions and cubed bacons. I’ve made several alterations depending upon the availability of ingredients as we all belong to different parts of the world and many of us are Vegetarians. ** Soya chunk is marinated with little red chilly powder, salt and turmeric powder. Pan fry them for couple of minutes. Can do the same for paneer and corn as well. Mix the sour cream, milk with either one of the ingredient available (cottage cheese or Ricotta or Crème Fraiche) and combine well. Season the cream with freshly grated nutmeg powder, salt and pepper. Mix thoroughly. The consistency should resemble like a white sauce. Set aside. Mix the cream cheese with the fresh cream and mix well until it forms a saucy consistency. U may add more fresh cream to attain the consistency. Season with freshly grated pepper powder, nutmeg powder and salt, mix well. Set aside. Take both the flour in a bowl and add the olive oil. Mix the oil with the flour thoroughly using ur fingers. Now add the ice cold water little by little and form a STIFF dough, be careful not to add more water. Slightly grease the outer surface of the dough with olive oil and cover it suing a cling wrap. Refrigerate the dough for 1 hour. Saute the finely sliced onions with little bit of olive oil for a minute, transfer and set aside. • Preheat oven to 205 deg C. Line the baking sheet with parchment paper, set aside. • Roll out the dough to form a thin ( thin like for making Phulkas) oval/ rectangle shape ,place on the prepared baking sheet and form a slight border by pinching the edges upward. • Spoon the already prepared sauce mixture ( be generous) evenly over the pastry. Distribute the onion slices over the top, sprinkle on the chopped soya chunks, add the grated cheese on top and bake for 15 to 20 minutes, or until the pastry is golden brown. Cut the tart into rectangles/triangles to serve. • Do not worry if u don’t get Crème Fraiche , u can just make it at home. Take a look at this page to learn more. • Well, if u don’t wanna strain much, u may use cream cheese in place of Crème Fraiche or cottage cheese or Riccota Cheese, and u r welcome to skip sour cream and add fresh cream instead. • In this recipe I’ve used Cream Cheese, Sour cream, Milk, salt, pepper and nutmeg, freshly grated and made a sauce. • Never ever use fat free products esp. 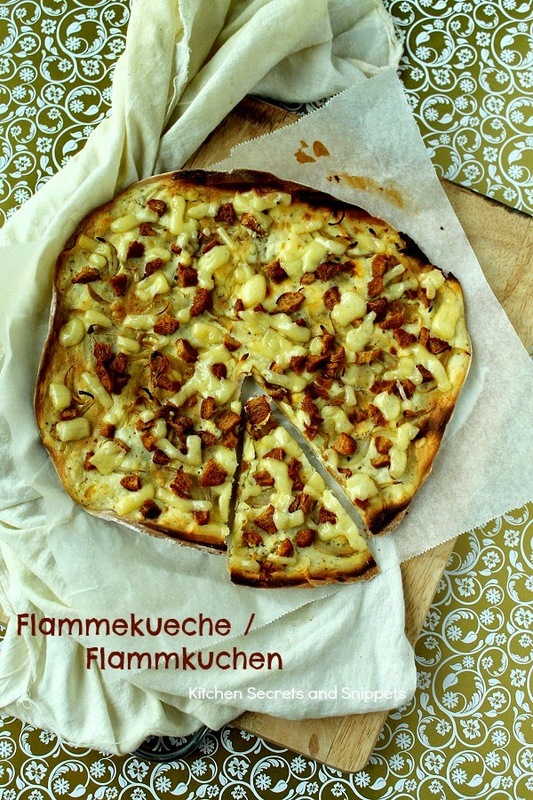 to make this Flammekueche, the end product doesn’t tastes good. • For 1 ¾ cups of flour, u’ll get 3 tart in total, but I must say, 3 tart serves 2 nos as it is very thin. 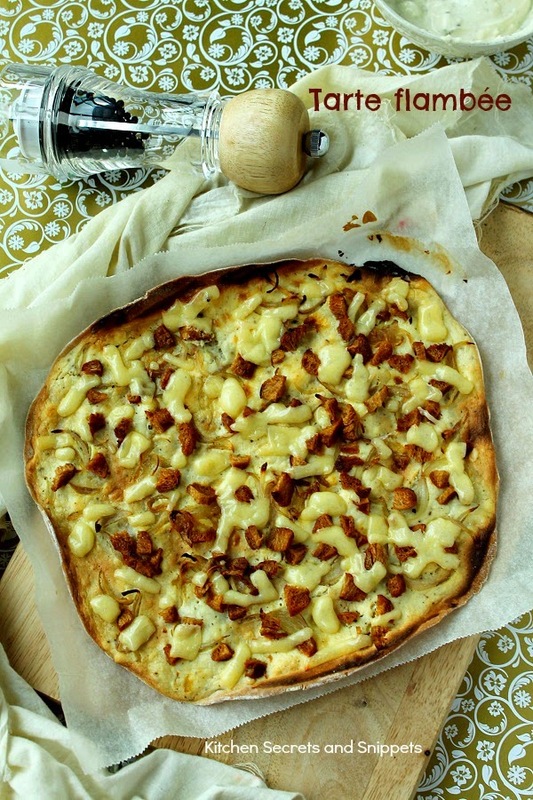 International Food Challenge -2, Alsace Lorraine, Kindly link your IFC challenge recipes here..
Looks great as usual and great selection of choices..
Fabulous tarte flambee dear :) a very nice choice for this month challenge .. looks superb !! G'day and big thanks for hosting such a great linky party and hosting re challenge # 2! I really enjoy food wise world wide, learning something new! I have added comments on the above and look forward to people visiting and commenting on my blog so we can all spread the word about this wonderful challenge that has brought us all together! wodnerful cliks n nicely dpne.inviting.